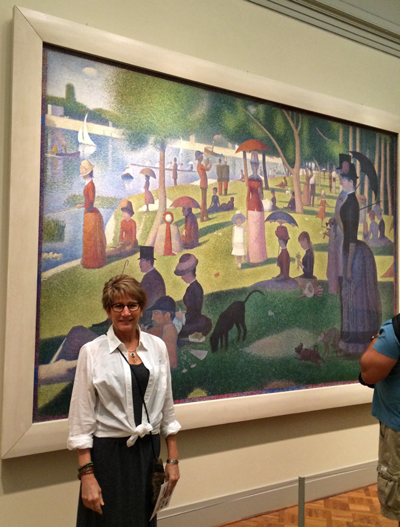 While I was in Chicago this past weekend, we headed over to the Art Institute of Chicago. I always learn something new. The exhibits change many times throughout the year. I was talking with a docent and he said that only 5% of the artwork is on display at any one time. This year’s ArtWalk event focuses on Seurat and pointillism. 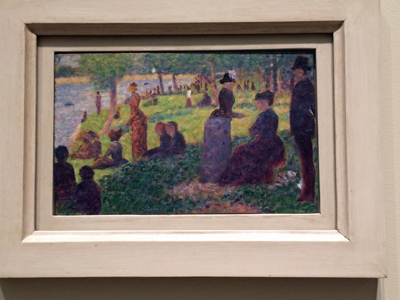 So, I had to head to the gallery displaying Georges Seurat’s paintings. Lisa and Lynn are working on painting our small version of this famous painting by Georges Seurat, “A Sunday on La Grande Jatte”. Georges painted 24 studies before approaching the large canvas that we see today. He continued to rethink the composition adding a sense of grand solemnity and wry humor – a sophisticated irony that is completely absent in the small oil panel. In another part of the museum’s gallery, there are two paintings that caught my eye. 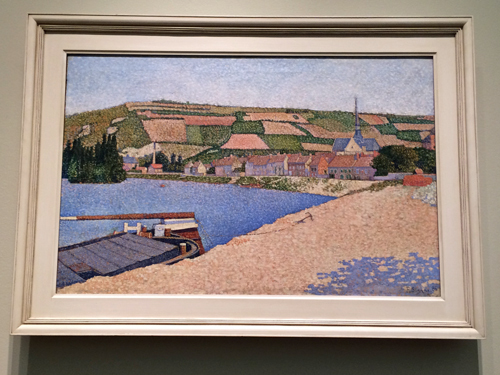 One by Henry-Edmond Cross and another by Paul Signac. These artists were friends of Georges Seurat and painted in a similar style with all-over dots and then dashes of strong color that were the hallmark of the Neo-Impressionist group. 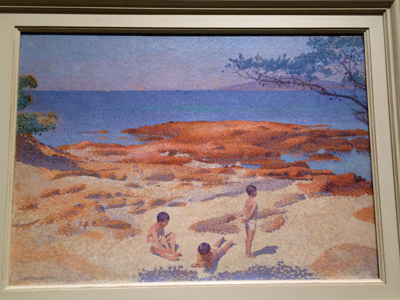 Henri-Edmond Cross moved to the Mediterranean coast due to his rheumatoid arthritis. This move deeply affected his art. At this time, he embraced the divided brushwork of small dashes and dots of color applied regularly throughout a composition. He used color gradations which became his means of capturing the color and heat of his adopted region. I can’t wait to see all of the versions hanging in Grand Haven storefronts as the summer progresses. Time to get into the studio to glaze pots.